Here is my panel schedule for FenCon, coming up this weekend (Sept. 25-27, 2015) in the Dallas-Fort Worth area. If you've never been to this con before, you're missing out! Click here for more information. It was more fun than you can shake a stick at! EDITED TO ADD: Alas, no ArmadilloCon after all, due to an infected wisdom tooth. Surgery on Monday. Wish me luck! Looking forward to ArmadilloCon in Austin this coming weekend. I've got some fun panels, two of which are timely considering I'm doing a lot of reading this days, especially short fiction. Our annual rundown of the year's best. Looking forward to catching up with a lot of folks! 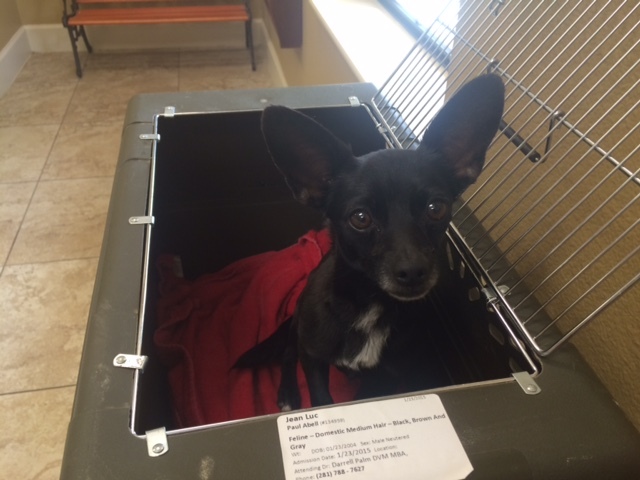 On April 8, we found a limping black Chihuahua puppy in front of our house. (Bay Glen subdivision, Clear Lake area of Houston, zip 77062) Our vet thinks he is about 1 year old; he is unneutered and weighs 6.6 pounds. He was not chipped. Because we do cat rescue and are caring for some elderly cats with medical issues, we cannot foster him in our home, so we've been boarding him at our vet's office. Which, needless to say, is getting expensive. The puppy has also tested positive for heartworm. We are paying for his treatment. I am willing to drive the dog just about anywhere to get him into a loving home. If you've always wanted a Chihuahua but didn't want to go to a breeder, please consider this sweet little guy. I've spent time playing with him at the vet's. He is sweet and is not a barker. He's a bit timid, so probably better off in a less chaotic home. Thank you in advance! Please pass this on to anyone you think might be interested! I can be reached at amysisson at prodigy dot net. Paul and I joined an organic produce co-op a few weeks ago, and I'm really enjoying it, as it's inspired me to try a bunch of new fairly healthy recipes. I posted about it on my reviews blog here. In other news, I now have five stories up on QuarterReads, the site where readers buy a "roll" of virtual quarters, browse the free preview beginnings, and then pay a quarter to read any given story that they want to finish. Four of the five I have up there are reprints, but one, titled "When Sidekicks Fight Back", has not been published elsewhere. I'm enjoying QuarterReads as both a writer and a reader, so I encourage people to check it out. I don't know if anyone on my LJ friendslist is a fan of Top Chef, but I'm blogging this season and wanted to mention it in case anyone is interested. I don't mean live-blogging, but rather posting in-depth commentary the morning after the episode airs. My review blog is here (I review books, movies, TV shows, the ballet, the opera, film festivals, etc. ), and the first two Top Chef posts are here (Episode 1 and Episode 2). I try to mark spoilers in most reviews, but for Top Chef it's a given that those posts will have them. For anyone who is a SFWA member, you may be aware that the SFWA board will be deciding soon whether to allow the Young Adult / Middle Grade closed list-serv to continue past its six months' trial period. I've been pretty vocal about my opinion that it's inappropriate to set up a sub-group within SFWA that is closed to fully qualified SFWA members because they don't meet an additional (and in my opinion arbitrary) qualification. I think it's especially inappropriate because this group is using resources that are paid for by all SFWA members' dues. To date, those resources have been extremely minor, but the group plans to request more, such as exhibitor booth fees for various trade conventions. I don't feel that this is insignificant. It is my hope that the board will allow the group to continue on the condition that it open to all SFWA members. If they don't want to do that, I think they should disassociate the list from SFWA, and then the group can do whatever it wants. In any case, I wanted to mention it here in case any SFWA member cares to share his or her opinion with the SFWA board before a decision is made. I e-mailed my comments to the SFWA President earlier today. I read 109 books in 2012, not including picture books. The reading time on the commute has definitely led to an increase, although I find it much harder in the winter months when it's dark both coming and going. The commuter buses (as opposed to city buses) are equipped with reading lights at each seat, but I find it to be an eyestrain. Of the highlights, 3 were mainstream, 3 were fantasy, and 3 were science fiction. I still have to go back and figure the numbers for all 109 books. I'm not sure why I like to keep track. Part of it is the feeling of accomplishment I get from knowing how much I've read. Part of it is that I like to look at what kinds of books I've read, to inspire myself to stretch my boundaries a little more. I take reading, as well as supporting the publishing industry, very seriously. I don't buy everything I read, but I patronize my library a lot and I still do buy a lot of print books at various venues. Books just make the world a better place.